Proud of its past and of its participation in the Discoveries, the municipality of Vila do Bispo is an integral part of the Algarve, present and future. 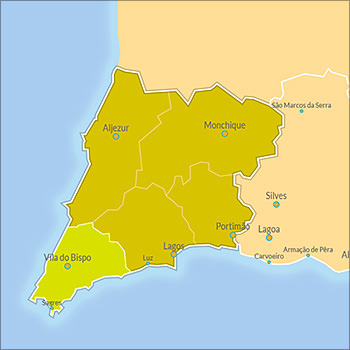 The municipality is currently divided in 5 main parishes: Barão de São Miguel, Budens, Raposeira, Sagres and Vila do Bispo. It is agreed that the human presence in the south-western Algarve goes back at least as far as the Neolithic period and, if some shallow graves are to be trusted, may date from the Palaeolithic period. The large number of menhirs — standing alone, in groups or in cromlechs — is one of the most important vestiges of the past to be found in the Vila do Bispo area. Also of interest is the fact that their use in religious rites continued, in the Cabo de São Vicente area, until the period of the Roman occupation. The religious importance of the Cape persisted in the Middle Ages with the pilgrimages that were made, even during the centuries of Arab rule, to the burial place of São Vicente (St. Vincent). In the 15th century, the presence of Prince Henry the Navigator at Sagres and the undertaking known as the Discoveries ensured Vila do Bispo a prominent place in history. Identified by some authors as the site of the then famous Igreja dos Corvos (Church of Crows) mentioned by Arabic chroniclers, Vila do Bispo has its origins in a village which was granted to the Bishop of Silves, D. Fernando Coutinho at the beginning of the 16th century, and was elevated to the status of a town in 1633. It suffered serious damage in the earthquake of 1755. The windmills which recalled the fact that, for centuries, Vila do Bispo was the breadbasket of the Algarve have disappeared. What remains, however, is the charm of whitewashed houses tumbling down the slopes of a hill crowned by a church tower.